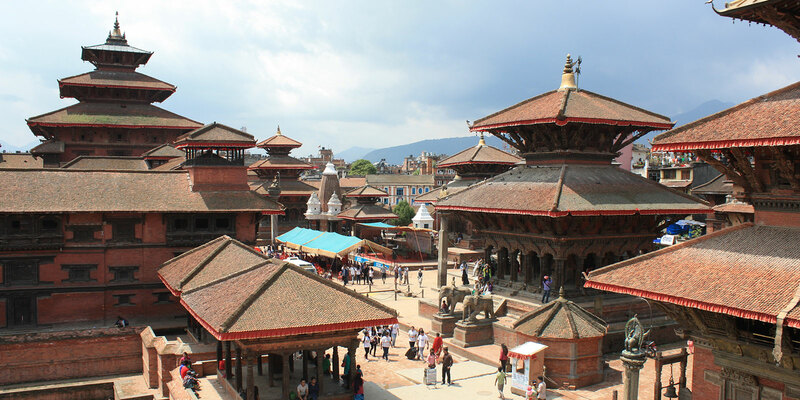 Kathmandu durbar square is situated in front of the old Royal palace, at the heart of ancient city of Kathmandu which is surrounded by both Hindu and Buddhist temple. Previously palaces were held by the Malla and Shah Kings who ruled over the city. The name Hanuman Dhoka durbar square came from the statue of Hanuman (the monkey devotee of Lord Ram), was established by King PratapMalla in 1672 A.D. Besides with these Durbar (royal palaces), the squares are surrounded by quadrangles, reviling courtyards and temples. The squares inside of the palaces are considered as major section, because the royal coronation of King BirendraBirBikram Shah Dev in 1975 and King GyanedraBirBikram Shah Dev in 2001 was held here. The palace is designed with high details of carved wooden window, panels and houses are made up of pagoda style. Only limited parts of the palace are open for the visitors whereas Taleju temple is only open for people from Hindu and Buddhism faiths. The major interesting things around the outer complex that perceive with the eyes is of Kumari (The living Goddess), Maru Ganesh, Shiv Parvati temple etc. Besides these, other interesting aspects are various festivals, cultural trends that have been followed from centuries, which are presented in the durbar square. These major festivals include gaijatra, indrajatra, machhendranathjatra etc.